We understand how hard life can be with missing or damaged teeth. Dentures or dental bridges are one solution, but they come with many disadvantages. People with dentures often worry about issues like plate slippage, so they have to avoid some of their favorite foods, like fresh fruit, corn on the cob, or a juicy steak. They often need to give up healthy activities such as swimming and dancing for fear of having their dentures slip, over even worse, fall out. Dentures are also a chore to take care of, and they tend to be uncomfortable for many people. They can also break or get lost. This affects a person’s true quality of life, making it difficult to manage many daily activities. are relatively straight forward with minimal pain. What are all on 4 dental implants ? All on 4 dental implants are a newly available procedure to replace a full arch of teeth in one go. This revolutionary All on four procedure allows implant surgeons to provide a natural looking fixed set of replacement teeth in just one day, with only four implants necessary. Although in some cases more implants can be used, a minimum of 4 implants is needed in order to support a fixed dental bridge. Am I a candidate for all on 4 dental implants. Using all on 4 dental implants, surgeons are able to provide a comprehensive oral rehabilitation solution to patients who suffer from tooth loss, or those who face a future of not having any teeth at all. We provide a free initial consultation with no obligation for patients considering all on 4 dental implants. During the free assessment, we can determine if this procedure is right for you, and then answer any questions you may have. This type of tooth replacement technique, innovated by dental implant surgeon, Paolo Malo, enables the dental implant practitioner to replace a patient’s entire mouth of missing or failing teeth using only four prosthetic implants and a fixed non-removable and fully-customized dental bridge. While all on 4 dental implants may sound incredibly simplistic, the advantages it has over traditional tooth replacement and implant techniques has given it enormously-important status in the medical fields of dental implant and oral rehabilitation. Also known as the “Smile in a Day” procedure, because the dental surgeon completes it in one day, the procedure for all on 4 dental implants allows the extraction of broken or decaying teeth and the placement of four tooth implants in the very same appointment. The Brighton Implant Clinic offers free no-obligation consultations, where our practitioners will explain how this procedure can provide a simple, effective and reliable solution to patients missing one or more teeth or facing the problems of fractured, decayed or loose teeth. In most cases, there is no bone grafting and fewer incisions are necessary, thereby shortening the healing time for patients. In fact, the All on 4 dental implants procedure is successful in more than 95% of all patients. All on 4 dental implants are one of the most exciting options available today in implant dentistry, because we are able to offer our patients the opportunity to feel like they have their own natural teeth back again. For many patients, due to the cost and many other factors, this was simply not possible with traditional implants. With all on 4 dental implants, many more patients now have the option to get fixed, permanent teeth at a considerably lower cost. Book an appointment | Brighton Implant Clinic For more information about All On 4 Dental Implants feel free to Contact Brighton Implant Clinic or Call us 0800 111 6623 for a FREE initial consultation, so we can help you smile with confidence and enjoy life again. Ask us about all on 4 dental implants today! Hi, the all on 4 implant treatment is suitable for those cases where patients where patients have all their teeth missing or advanced gum disease in either the upper or low jaw. I would recommend that the most important step to getting the information you are asking is to get a thorough assessment of the current status of your teeth , gums and bone. We provide a FREE assessment for implant treatment and would be able to give you an outline of the treatment required. Some cases are simpler than others, the most important factor being the quality and quantity of bone available for implant placement. The treatment usually takes about 6 months to complete although complex cases can take 12-18 months if bone grafting is required. The costs for this treatment vary between £6500 – £8500 per arch. This costs covers the assessment, radiographs, CT Scan, accommodation at local hotel for day of surgery 9 (if required), provisional bridge on the implants and the definitive bridge on the implants as well. If you require any further information please feel free to contact us. Hi my husband Mark has very bad gum disease and is fast loosing his teeth and this itself is making quite depressed, he also suffers a lot of pain each time a tooth becomes loose and the gum become inflamed. He has a bridge which he cannot use as every time he tries to insert it he feels sick. He is 55 and smokes – would the All on 4 implant be suitable for him. 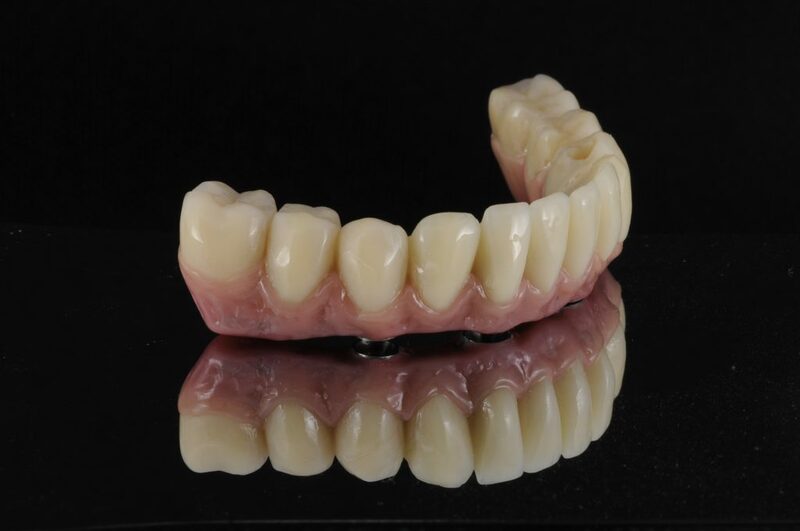 I have seen two dentist with regards having implants or a bridge. One recommended a bridge the other advised 4 implants with a bridge. I do have gum disease. I live in Essex do you have an office near me. Hi Moira, thanks for your inquiry. It sounds as though you have had 2 different options made available to you. It is possible that both options would work however you should be aware of the advantages and disadvantages of each option. At Brighton Implant Clinic we provide a FREE assessment if you are considering dental implant treatment. Our dentists are able to outline the advantages, disadvantages , risks etc of each option for you. What is important is that you make a well informed decision. If you would like further information please feel free to contact us. I have today had a tooth on the side of my mouth top right removed as crown broke and tooth had calcified. How long do I need to wait before I can think of a replacement . I just wanted to say a big THANKYOU to Bruno and his team for taking great care of me in January. I have had continual problems with my teeth throughout my adult life. Mid January Bruno and his team performed ‘all on four’ surgery. I had expected immense visible bruising and swelling, along with days of agonising pain following the surgery. After four days the majority of the external swelling had subsided. Three weeks later I’m able to chew food in all areas of my mouth, something I cannot remember ever being able to do! Finally – I have the confidence to laugh and smile without covering my mouth! Hi Colin, thank you so much for your kind comments about the clinic and the treatment you received from us. We really appreciate all of the feedback we receive from our patients and we’re so glad to have made you smile again. How much is the cost of the implant of booth upper and lower?? Hi Bethelple, thank you for your enquiry. Here at the Brighton Implant Clinic we start our prices at £995 per implant, however if replacing a number of teeth with multiple implants then the price does vary. We would advise that you come to see us for a free consultation at wither of our three branches. During this appointment the dentist can take any necessary X-Rays, carry out a full assessment and discuss the different options of treatment with you. From here the dentist can provide a Treatment Plan with the breakdown of appointments and costs fir the recommended course of treatment. Please feel free to contact us and we will be happy to help. thanks for the comment that you posted on our site. Firstly I would recommend that you seek the help of an experienced implant surgeon. The advantages and disadvantages/risks of treatment will be clearly outlined for you before any treatment is commenced. No two cases are the same so yes it may be helpful to get feedback from other patients however one cant be certain that you would have the same response or results as another patient. I can honestly say that the vast majority of our patients (I cant give you an exact percentage) are very happy with the results of the all on 4 implant treatment. If I said that every single patient was 100% satisfied would be dishonest as losing multiple natural teeth is a traumatic experience in itself. We have a very high success rate with dental implants >95%, the treatment really does work and has helped many patients regain their confidence and function after losing multiple teeth. I do not want to sound negative but I think that you should get as much information about the treatment you require and research the clinic which is carrying out the treatment. Removing multiple natural teeth is sometimes needed due to gum disease. Make sure that you know what treatment is best suited for you before going ahead with surgery.
. If I was to have all top teeth removed would I still need a nasal lift with all on 4. Hi Angela, thanks for your inquiry. It sounds like you may have been recommended a sinus lift? This is quite a common recommendation to patients when there is insufficient bone for dental implants to be placed in the upper posterior areas. A sinus lift is a procedure which increases the amount of bone available for dental implants to be placed. In some cases if patients are having a full arch of dental implants using teeth on 4 dental implants solution it is possible to bypass the need for sinus grafting. However it is very important that you have adequate amounts of bone for this. You would need to take a CT Scan to verify exactly how much bone is available for dental implant treatment. However if your other remaining teeth are healthy and working well then certainly removing the remaining teeth would not be recommended. More information is needed as to the status of the other remaining teeth. If you wanted more information about sinus lifts you can click on the link sinus lift. For more information about teeth on 4 you can check this link. If you wish to contact our clinic you can click on contacts. Would you be able to email me a quote on a whole new set of teeth.